Atkinson was brought up Anglican, and was educated at Durham Choristers School, a preparatory school, St Bees School. After receiving top-grades in science A' levels, he secured a place at Newcastle University, where he received a degree in Electrical and Electronic Engineering. In 1975, he continued for the degree of MSc in Electrical Engineering at The Queen's College, Oxford, the same college where his father matriculated in 1935, and which made Atkinson an Honorary Fellow in 2006. His MSc thesis, published in 1978, considered the application of self-tuning control. Atkinson briefly embarked in doctoral work before devoting his full attention to acting. First winning national attention in The Oxford Revue at the Edinburgh Festival Fringe in August 1976, he had already written and performed sketches for shows in Oxford by the Etceteras — the revue group of the Experimental Theatre Club (ETC), and for the Oxford University Dramatic Society (OUDS), meeting writer Richard Curtis, and composer Howard Goodall, with whom he would continue to collaborate during his career. ^ "Moves" also features on the Johnny English Strikes Again OST. ^ a b Duncan, Amy (12 November 2017). "Rowan Atkinson is set to become a father for the third time at the age of 62". Metro. Retrieved 13 November 2017. ^ "Rowan Atkinson". Front Row Interviews. 8 January 2012. BBC Radio 4 Extra. Retrieved 18 January 2014. ^ ATKINSON, Rowan Sebastian. ukwhoswho.com. Who's Who. 2014 (online Oxford University Press ed.). A & C Black, an imprint of Bloomsbury Publishing plc. ^ "Rowan Atkinson: Biography". MSN. Retrieved 9 February 2012. ^ "Rowan Atkinson: Biography". TV Guide. Retrieved 9 February 2012. ^ a b Barratt, Nick (25 August 2007). "Family Detective — Rowan Atkinson". The Daily Telegraph. UK. ^ Foreign Correspondent — 22 July 1997: Interview with Rodney Atkinson Archived 7 August 2009 at the Wayback Machine Archived 7 August 2009 at the Wayback Machine, Australian Broadcasting Corporation. Retrieved 27 January 2007. ^ Mann, Virginia (28 February 1992). "For Rowan Atkinson, comedy can be frightening". The Record. Archived from the original on 2 June 2007. Retrieved 10 December 2007. ^ Roberts, J F (2014). The True History of the Black Adder: At Last, the Cunning Plan, in All Its Hideous Hilarity. Random House UK. p. 20. ISBN 9780099564164. ^ a b c "BBC — Comedy Guide — Rowan Atkinson". BBC. 4 December 2004. Archived from the original on 4 December 2004. Retrieved 29 December 2008. ^ "page 6: "The donation was given in memory of Rowan Atkinson's father, Eric Atkinson, who graduated at Queens in 1935."" (PDF). Archived from the original (PDF) on 11 July 2011. Retrieved 21 June 2011. ^ "queens iss 1" (PDF). Archived from the original (PDF) on 18 October 2012. Retrieved 21 June 2011. ^ The Stuttering Foundation (13 March 2019). "Who Knew? Mr. Bean?". ^ "BBC — Comedy — Blackadder Goes Forth". ^ "Is Blackadder bad for First World War history?". ^ "BBC News Blackadder star Sir Tony Robinson in Michael Gove WW1 row". BBC News. 5 January 2014. ^ "RUSI — Dealing With the Blackadder View of the First World War: The Need for an Inclusive, Bi-Partisan Centenary". RUSI. Archived from the original on 13 April 2014. ^ "Culture, attraction and soft power" (PDF). British Council. 3 December 2016. ^ a b "Museum.tv". Museum.tv. Archived from the original on 5 October 2014. Retrieved 21 June 2011. ^ mhm grax. "Kronenbourg Commercial". Mhmgrax.com. Archived from the original on 14 July 2011. Retrieved 21 June 2011. ^ "Mr. Bean's Hilarious 'Chariots of Fire' Skit at Olympics". hollywoodlife.com. 27 July 2012. Retrieved 27 July 2012. ^ "Mr Bean's Olympic orchestral appearance". BBC News. 27 July 2012. Retrieved 28 July 2012. ^ Cavendish, Dominic (21 November 2012). "Rowan Atkinson: Goodbye, Mr Bean?". London. Retrieved 30 August 2015. 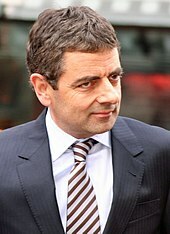 ^ "Mr Bean: Rowan Atkinson will never "retire" from playing the character". Radio Times. 21 March 2016. Retrieved 10 October 2018. ^ Shepherd, Jack (20 March 2017). "Rowan Atkinson reprises Mr Bean role for Chinese film Top Funny Comedian: The Movie". The Independent. Retrieved 30 March 2017. ^ "Rowan Atkinson working on new animated Mr. Bean series". British Comedy Guide. 22 January 2014. Retrieved 30 August 2015. ^ Franks, Nico. "Mr Bean toon to return next year". C21Media. Retrieved 9 November 2018. ^ "Happy New Year 2019: Cartoon Network Year 2018 In Review". Regular Capital. 9 February 2017. Retrieved 3 January 2019. ^ Gilbey, Ryan (9 October 2011). "Rowan Atkinson: Mr Bean shows his serious side". The Independent. London. Retrieved 21 November 2015. ^ "Christian Bale — Screenshots and Info for Actor Christian Bale". ^ Gottlieb, Vera; Allain, Paul, eds. (4 November 2000). "Appendix 2:Select Stage Productions". The Cambridge Companion to Chekhov. Cambridge University Press. p. 257. ISBN 978-0-521-58917-8. ^ Spencer, Charles (January 2009). "Review of Oliver! opening night". The Telegraph. London. Retrieved 24 January 2015. 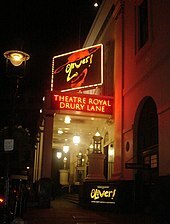 ^ "Olivier award winners 2010". The Olivier awards. March 2010. Archived from the original on 10 February 2015. ^ Deacon, Michael (29 November 2012). "Review of 'We are most amused' (2012)". The Daily Telegraph. London. Retrieved 25 January 2015. ^ "Quartermaine's Terms — review". The Guardian. 3 February 2013. Retrieved 27 January 2015. ^ Brian Logan (1 December 2013). "Royal Free Rocks with Laughter — review". The Guardian. Retrieved 21 November 2015. ^ (SMH/WNTSU/LR). "Rowan-Atkinson-plays-surprise-comedy-show-in-London_26375720". RTV6. Archived from the original on 17 December 2013. ^ "Atkinson 'averted air disaster'". BBC News. 24 March 2001. Retrieved 5 July 2015. ^ Hough, Andrew (5 August 2011). 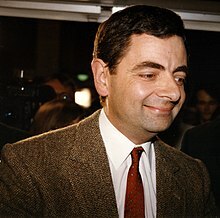 "Rowan Atkinson: Mr Bean star known for satire and love of fast cars". The Daily Telegraph. London. Retrieved 30 January 2014. ^ "Beany wonder". The Hindu. 10 June 2007. Retrieved 11 November 2015. ^ "Rowan Atkinson divorced in 65 seconds on grounds of his 'unreasonable behaviour'". The Daily Telegraph. 10 November 2015. Retrieved 11 November 2015. ^ Freeman, Simon (20 June 2005). "Rowan Atkinson leads crusade against religious hatred Bill". The Times. UK. Retrieved 22 September 2009. ^ Geen, Jessica (19 March 2009). "Rowan Atkinson attacks gay hate law". Pink News. Retrieved 21 June 2011. ^ "Rowan Atkinson: we must be allowed to insult each other". The Daily Telegraph. London. 18 October 2012. Retrieved 21 October 2012. ^ "Rowan Atkinson's address to the Reform Section 5 parliamentary reception". reformsection5.org.uk. 16 October 2012. Retrieved 21 October 2012. ^ "Atkinson's religious hate worry". BBC News. 7 December 2004. Retrieved 9 January 2016. ^ "Atkinson defends right to offend". The Daily Telegraph. 7 December 2004. Retrieved 9 January 2016. ^ Dargis, Manohla (7 February 2005). "Rowan Atkinson: The Driven Man — Trailer — Cast — Showtimes". The New York Times. ^ Dunning, Craig (5 August 2011). "Mr Bean and Blackadder star Rowan Atkinson in hospital after McLaren F1 supercar crash". The Daily Telegraph. Retrieved 5 August 2011. ^ "Update: TV star Rowan Atkinson in hospital following Cambridgeshire crash". Evening Star. ^ Warnes, Sophie (7 February 2013). "Rowan Atkinson crash forces insurers to pay out record £910,000 to repair supercar". The Independent. London. Retrieved 26 March 2015. ^ "The cars of the stars: Rowan Atkinson". bankrate.com. Retrieved 30 April 2014. ^ a b Wormald, Andrew (31 May 2011). "Stars & their Cars: Rowan Atkinson". MSN. Archived from the original on 18 September 2009. Retrieved 21 June 2011. ^ "Atkinson unharmed after car crash". BBC News. 9 July 2001. Retrieved 27 February 2016. ^ "Museum.tv". Museum.tv. Archived from the original on 5 October 2014. Retrieved 21 June 2011. ^ "Birthday Honours: Adele joins Blackadder stars on list". BBC News. 14 June 2013. Retrieved 8 September 2013. ^ "Video: Mr Bean Does Kung Fu in Snickers Ad". Time. 8 October 2014. Retrieved 26 July 2015. ^ "Video: Watch Rowan Atkinson roams the UAE in new commercial". 2018. ^ "Olly Murs drops his 'Moves' music video and it includes a VERY famous face". 17 October 2018.